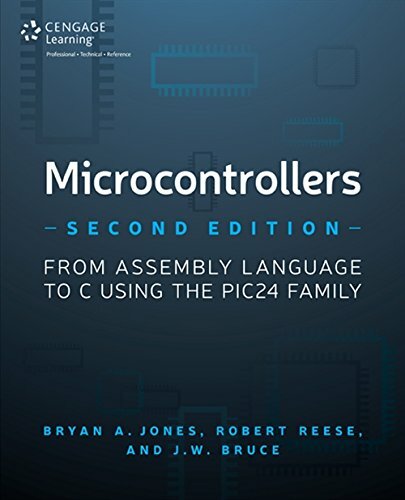 This completely updated second edition of MICROCONTROLLERS: FROM ASSEMBLY LANGUAGE TO C USING THE PIC24 FAMILY covers assembly language, C programming, and hardware interfacing for the Microchip PIC24 family, a recently updated microcontroller family from Microchip. Hardware interfacing topics include parallel port usage, analog-to-digital conversion, digital-to-analog conversion, the serial peripheral bus (SPI), the inter-integrated circuit bus (I2C), asynchronous serial communication, and timers. Assembly language programming is covered in the context of the PIC24 instruction set, and no initial knowledge of assembly language programming is assumed. Specific hardware interfacing topics covered are parallel IO, analog-to-digital/digital-to-analog conversion, pulse width modulation, timer usage for IO polling, and industry standard serial interface standards. Interfacing examples include external devices such as pushbutton switches, LEDs, serial EEPROMs, liquid crystal displays (LCDs), keypads, rotary encoders, external digital-to-analog converters, DC motors, servos, temperature sensors, and IR receivers. Master the PIC24 family with MICROCONTROLLERS: FROM ASSEMBLY LANGUAGE TO C USING THE PIC24 FAMILY. If you have any questions about this product by Cengage Learning PTR, contact us by completing and submitting the form below. If you are looking for a specif part number, please include it with your message.